In my mind, downtown is limited by Jack London Square, Oak Street/Lake Merritt, 580, and West Grand. What the heck is “sobo”? I like your map. My neighborhood falls right on the edge of the Uptown Triangle (23rd Street) and I definitely feel like I am in downtown. masb: Thanks! In light of the Auto Row redevelopment and the lack of a physical barrier at Grand, areas between the DTO and Koreatown are more downtown than anywhere else, at least. But first the neighborhood will need a new name – Northgate reeks of planner-ease (Uptown used to be called Gateway by the city in the pre-Jerry Brown era). Please check out these maps I made. 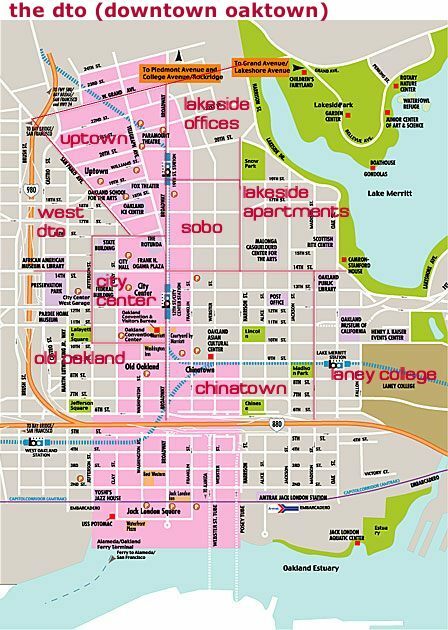 Not my own mental maps, but defined by the city way back in 1982, but still really useful (at least for me) in understanding the geography of Oakland. Huh, I guess I’d think Jack London isn’t downtown because downtown is (in my mind) defined by its use. Downtown is the corporate center, Jack London is still mainly a tourist and residential district. SOBO? That area is east of Broadway; Broadway is a north-south street. I know about the tradition and all, but I don’t think the name of the area has to be the same as those shops, especially when it’s so confusing. Ian, as you probably know, Oakland is not planned along an axis. South is actually a better description of that side of Broadway than East. dto510, Broadway runs what? …northeast /southwest? so you are both correct on some level, no? Anyways, for what it’s worth, convention and tradition here in Oakland seems to give it a bit of an East/West Axis along 14th St., and North/South along Broadway. Hence: “East 14th St.,” “East Oakland.” Please educate us to the error of our ways if this is wrong. Matthew: great map! Thanks for the link.